Hello, I'm Gregor and I put this site together. 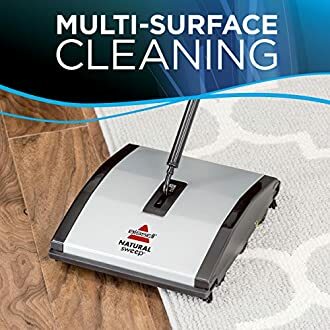 At first, you'll find an overview of recommended carpet sweepers, followed by a public poll and a general buying guide on carpet sweeper. Further down on this page, we do link to other well-written articles and reviews about carpet sweepers. At last, you'll be able to weight in your own opinion in the comments section. If you also want to vote on the best carpet sweeper, click here to view the poll. Cleaning is a messy business. It can be noisy, too. That is precisely why carpet sweepers have lasted on the sweeping market so long. They were first patented and introduced to the public by a gentleman who lived in Grand Rapids, Michigan in 1876. His name – Melville Bissell, a name most of us know well. Carpet sweepers are the granddaddy of today’s, and even yesterday’s, electrical vacuum cleaners. And these handy gadgets likely will be around for a long time to come. Why? The reason is simple. 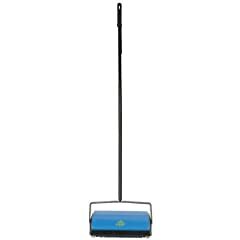 The carpet sweeper’s ability to clean carpets in a most quiet and unassuming manner makes it the ideal device for businesses to clean up messes without disturbing patrons. They are widely used in restaurants, in particular, because staff members can keep carpets free of dirt and debris, all while diners eat their meals with barely an acknowledgement of the cleaning going on around them. But carpet sweepers aren't just useful for businesses. They are also still popular with residential consumers because they are convenient, quiet, and don't require electricity. Much like the electrical vacuum cleaner you likely own, a carpet sweeper is a mechanical apparatus used to clean carpets. The major difference is that carpet sweepers do not need electricity to work. Like other vacuum-like machines, a carpet sweeper typically contains a long handle that enables users to push it along the floor. At the end of the handle is a box-like base that contains brushes, rollers, and a capsule that holds the dirt. The entire mechanism works via gears or a belt. When the user pushes or drags the sweeper along the carpet by its long handle, the rollers begin turning. That inner working causes the brushes to rotate, thereby sweeping dirt off the floor into the dirt capsule. What are the features available in a carpet sweeper? Carpet sweepers are very economical. They range in price from under $20 up to around $100. Rarely will you find a carpet sweeper that costs more than that. Some have adjustable handles that enable users to fine-tune handle height to better suit their needs. One of the best features of nearly all carpet cleaners is their lightweight build, which makes them convenient for elderly people and even children to use. Because they don’t require electricity, carpet sweepers are great for quick cleanups, which is another reason many restaurants keep one around. Many of these sweepers are capable of cleaning certain types of floors, carpets, and low-pile rugs. Carpet sweepers typically are not made to be used on high pile rugs and carpeting. 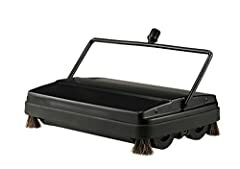 However, many sweepers are made so users can collapse the handle, lay the entire mechanism flat, and clean underneath beds and other furniture items. Should I purchase a carpet sweeper? In our modern world of electrical devices such as vacuum cleaners that are capable of unmanned roaming, carpet sweepers typically are meant to be a sort of ‘add-on.’ Few people these days have just a carpet sweeper. These handy little machines generally are meant to be used as a quick convenience. Users grab them for quick cleanups so they don’t have to get out the big vacuum cleaner or use up more electricity. 	Convenient to use: You don’t have to mess with getting out the big vacuum cleaner. Just grab the carpet sweeper and clean. Because of their convenience, consumers tend to use them for regular, even daily, cleaning. 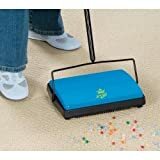 	Quick: Carpet sweepers are great for quick cleanups. 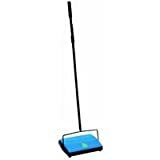 	Height adjustable: Most carpet sweepers have adjustable handles to enable people of most heights to use them with ease. 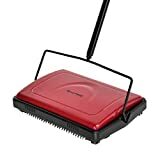 	Collapsible handles: The handles on many sweepers contain a mechanism that enables users to collapse the handle and lay the device flat in order to clean underneath furniture and other items. 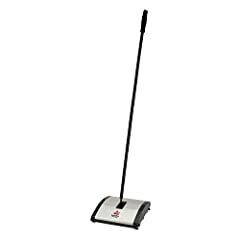 	Lightweight: Carpet sweepers are meant to be used easily and quickly, so they typically are very lightweight, unlike most electrical vacuum cleaners. 	Economical: Carpet sweepers come with a low price-tag that’s friendly for nearly every budget. They’re also economical because they don’t require electricity. 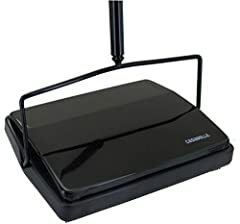 	No cords: Carpet sweepers contain no cords to mess with, which adds to their ease-of-use. 	Environmentally responsible: Because they require no electricity, carpet sweepers are environmentally friendly. 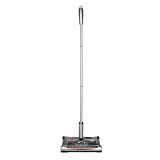 	Can’t clean high piles rugs: Carpet sweepers are meant for quick cleanups and touch-up cleaning of lower pile rugs and carpets. They aren’t meant to clean rugs and carpets that have a high pile. They’re also not meant for deep cleans. 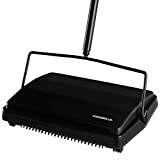 	May not work on corners: Carpet sweepers typically are boxy in shape, which can make them difficult to use in corners depending on where a product’s rollers are placed. If you require a sweeper that can be used easily to clean corners, consider purchasing one whose rollers are near the edge. 	Can be difficult to push: Like any non-electrical device, a carpet sweeper can be harder for some people to push over rugs. Consider a gas or electric lawn mower versus a push mower. Though the push mower is more convenient for quick grass cutting, it’s harder to push because the user has no help from electrical mechanisms. This is the same for a carpet sweeper, and it’s one of the reasons that people who own one also have an electrical vacuum cleaner. Which carpet sweeper is best for me? As mentioned above, a carpet sweeper is a handy device that is easily used for quick and even regular cleanups. If you have a low pile rug or carpet, you may want to consider purchasing one of these very accommodating little appliances for convenience and economy. Here are some of the most popular carpet sweepers on the market today, all carrying customer top ratings. 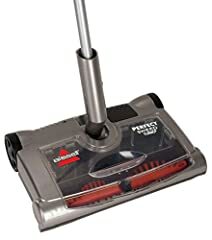 Dirt Devil PD10010 Simpli-Sweep Manual Push Sweeper for Carpets & Floors At a nice low price, this handy carpet sweeper from well-known Dirt Devil also comes with a lightweight and compact design that’s great for quick cleanups and easy storage. Its scratch-resistant wheels help give it long life and make for quiet operation. Plus, it has a convenient mechanism that makes for easy dirt disposal. This one is the lowest-priced carpet sweeper on our list. Bissell Sweep Up 2101-3 Cordless Sweeper Bissell is a name everyone knows, and for good reason. 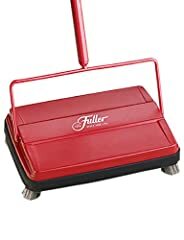 Not only did Mr. Bissell invent these handy devices, but his company leaves behind a legacy of solid carpet sweepers such as this Bissell Sweep Up. It can be used easily on both bare floors and carpet. It boasts easy pick-up of debris from both forward and reverse motion. And it comes with easy-to-empty dirt pans that make its own cleanup a breeze. This one is another of the lower-priced machines on our list. Again from Bissell comes another budget-friendly sweeper, this one also in the lower-priced range. Part of its claim to fame is its ability to pick up pet hair because of its dual rotating brush rolls. Also, this one has an eco-friendly design that is PVC-free and features parts made of 100% recycled plastic. Fuller Brush is another big name in sweepers. And, even though this one has the highest price on our list, it’s still very economical with a price-tag that can fit into nearly all budgets. Its ability to pick up pet hair, glass, and other tough debris make it a good choice for both business and residential consumers. Its compact, portable, and lightweight design mean users can move it from one room to another without straining. Plus, it folds flat for easy cleaning under furniture and convenient storage. New: Our editorial list of additional articles. We decided to gather informartion all around the internet and present you a list of helpful, external links to interesting reads about the best carpet sweepers and their reviews and guides. You're not convinced by the previous writings about carpet sweepers? Of course you can just choose by visual impression, that's why we present you all our chosen products at a single glance. A click on any image is enough to open an external link to the best offer we could find. Finally, we want to present you our rating criteria for our carpet sweeper comparison, so you can better understand and comprehend our recommendations and the rating process itself. Furthermore, we still ask you to keep your eyes open for short term deals in order to make some great bargains with carpet sweeper in 2019. Published by G. Krambs on StrawPoll.com (last update on 2019-04-19 08:13:23). 16 of 20 readers found this article helpful.